You may return to the main page here. My first feature film Gone will picture lock soon. Production company Amazement's other grandiose production, Kaikki kuvaa EDU was released this fall. It is a film education website for primary school teachers. My first feature film wrapped shootings in February, will go to post-production in May. A filmmaking competition we organized via our film education website received 280 entries nationwide. It's all building up to a Oscar-kind gala show, premiering 2nd May on the Finnish Broadcasting Company's channel TV2. Amazement also received funding from Finnish National Board of Education in order to develop a new groundbreaking Kaikki kuvaa EDU website, teaching film as a learning method to primary school teachers. Last month Amazement went to Tenerife to film some crucial scenes for my first feature film. The shootings continue next week in Finland with the most important two weeks ahead in May. Yesterday, we also applied for further funding for our film education website. My latest film J��hyv�iset Esoille won the 2nd prize in the Uneton48 competition 2013! In addition, our film education website Kaikki kuvaa has received further funding. We'll be producing new material for the site during fall 2013. Our film education website Kaikki kuvaa has been launched, finally. I wrote, directed and edited the site's 8 video tutorials and an example short film they're based on. The site was covered well in Finnish media! The Waiting Room was accepted to Helsinki Short Film Festival! It will be shown as the opening film of the festival on Monday, 13th November at 15:00. My film education website project Kaikki kuvaa has a preview website out, too - only in Finnish. 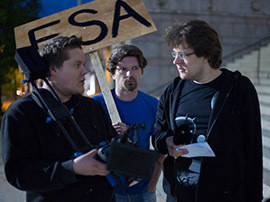 Ministry of Education and Culture of Finland granted funding for Amazement's big scale film education website project! The website, published early 2013, teaches film to children. I will be working as a producer starting in July. During the spring I've been editing corporate videos and documented the co-operation of artists and teachers within the Artist in School project. My plans for the summer will be clear in a week. We created a campaign video for Pekka Haavisto, a Finnish presidential candidate. I took care of photography and editing. I shot and edited a showreel for actor Panu Tuomikko. Check it out here! My first documentary, For Those Who Remain (38') was accepted to Helsinki Short Film Festival! My new photo portfolio is now published. Check out the photos here. Amazement's film for Uneton48 which I directed, shot and edited was selected among the top 15 of the competition. You can watch it here (no subtitles). For the past year I've been working on a personal documentary film which is now in post production. It will be released in the autumn. For the following year I'll be working as a film artist for Annantalo arts centre's "Artist at school" project. 10 artists from different fields are sent to elementary and lower secondary schools in Helsinki. They will work alongside teachers to approach the material from an artistic point of view. We took part in a 48 hour film contest Uneton48 with our group Amazement! Our film "Thou shalt not kill" will be shown at Maxim 2 on the 9th of June at 18 o'clock. I opened a weblog. It's in Finnish so it's only accessible via the Finnish site. Welcome to my new website! Together with this thorough update I published my new showreel. Make sure to check it out! I completed working on my new photo portfolio. See the photos here. My latest film Ihmisi� tiell� was published on its website early January. You can watch the film here! On 30th November, I graduated as a Bachelor of Culture and Arts from Tampere University of Applied Sciences, School of Art and Media. I specialised in directing and screenwriting. A christmas gift will also be given: My latest film Hit the Road will be published on its website by the end of this year. My final thesis Written film: why is picture and sound created through text? is now finished. I am going to graduate as a Bachelor of Culture and Arts during November. Additionally, there are some great festival news! My latest film Hit the Road was chosen for the film student programme at Kettup�iv�t short film festival. The program will be published on the festival page on the 16th of November. On the top right corner you may choose a colour palette and browsing is now possible in both Finnish and English. Additionally, my showreel is finally finished and watchable! XHTML and CSS is all by me. I got a little help with PHP from Vield. In other news, Once Upon got selected for Signes de Nuit film festival in Paris, France! It will be shown as a part of the Discoveries programme on 28th of June. Typically the website is only in French. During the spring I've been working as a timelapse photographer for Helsinki-filmi and as a website designer for Dionysos Films. Starting in April, I've been also working as a weekly documentarist in Frozn's campaign. They are in search of "pure things". My film Hit the Road will be finished during May. For the first time it will be presented at Tampere Art Factory from 15th to 16th of May. This website will be fully updated in June. I'm as a 3rd assistant director in Helsinki-filmi's feature film called Playground. Other than that, Hit the Road's trailer was published a week ago, check it out! The first 9 days of the shootings of Hit the Road are now in can, everything has worked out beautifully. We'll shoot the last two days during the next weekend. You can find out more about the film on its website. Once Upon is now downloadable from the net! Go see it here! I also edited Energia Productions' teaser trailer for the feature film Iron Sky. In just two days it has gained 50 000 viewers worldwide through YouTube. See it yourself here. Also, go here to find out more about the film. My new short film Once Upon will have its premiere on 6th March when it'll be shown at Tampere Film Festival as part of the TTVO showcase. The place is H�ll� and the time 14:00. Tickets cost 6 EUR. In the same show they will also play Flippers, a short film by Jussi Autio, which I edited and Lord's Angel, a short film by Venla Varha, in which I worked as a camera operator. My next short film Once Upon is in the pre-production. The film will be shot in 16mm film and it'll be finished in early 2008. Other than that, I will be editing another 16 mm short film project, Jussi Autio's Flippers. Against the Dark won the gold medal in the SM 2007 festival's student programme! At the moment I'm editing material related to the feature film Iron Sky. The final thing will be published during the autumn. I directed a tv series pilot for a show called Doctor Z and the Agents. Next week we'll start discussions about the series with Finnish Broadcasting Company. Filmgoer.fi interviewed me about the film Against the Dark. Read the interview here. Only in Finnish. I co-wrote and edited a music video Pelimies for Heikki Hela. During March I will be working as a director for a children's tv series' pilot episode.